Please note: The use of images of Janis Joplin for commercial purposes is controlled by Fantality Corporation. To inquire about commercial use of Janis's image, please email estate@officialjanis.com. 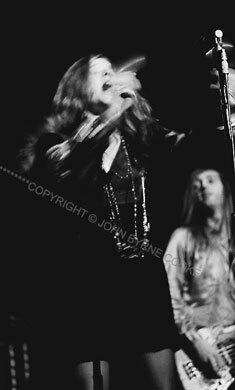 If you are interested in using one of John Byrne Cooke's photographs of Janis for a commercial product, please include that information in your inquiry. Also available - Janis Joplin video: While traveling with Janis Joplin as her road manager, 1968-1970, John Byrne Cooke filmed Janis and her band members on Fuji 8mm film. This footage has been transferred to Beta-SP video. Approximately 85 minutes of video is available for consideration on a VHS window dub. This video footage is not for sale. It is available only for licensing to film and television producers with projects in active production. To inquire about viewing and licensing this footage, please first read the Licensing Information page and use the link there to send your inquiry.